Get easy and affordable heating & cooling options for your Toronto or GTA home with our high-efficiency furnace and A/C rentals! There is no doubt that one of the things that make Toronto one of the greatest cities in Canada is variety of people, culture, and events and activities. Toronto and the GTA’s varied climate means that from winter to summer, residents must deal with oppressive heat, and biting cold. 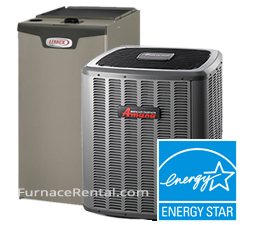 Renting a furnace or AC unit offers superb flexibility and affordability as opposed to outright purchases. Many people in Toronto have already discovered the many benefits that come with renting an HVAC appliance from us so take this opportunity to find out a little about what these people already know. Flexible Credit Approval – Our easy credit approval process means many homeowners are approved immediately! Professional Installation – We know better than anyone on Toronto how important professional installation is to the overall performance of your furnace or air conditioner so you can count on all of our installation techs to be fully certified and licensed. No matter the layout of your home, we can install your unit and in many cases, we can do so the day after you contact us. Flat Monthly Rates – It is not our intention to confuse our customers with complicated and fluctuating monthly bills. With our furnace and air conditioner rentals, you know exactly what to expect, making budgeting a breeze! No unexpected expensive repair costs when you rent! Outstanding Customer Support – Customer care is very important to us so we guarantee that we will be there for you no matter what may happen with the appliance you rent from us. Not only are our experts on call for you every day of the year, there is absolutely no additional service charge should you need our help no matter how many times you call us out. Trusted Brands – There is simply no skimping with us. We are proud to be able to say that we offer affordable rental rates, free service calls, guaranteed approval world-class installation and the brands you have come to know and trust like Goodman and Amana. No matter how badly you have been burned by prior HVAC retailers and contractors we do everything we can to ensure you will be happy with your experience with us. Our HVAC rental program can fit any need and any budget and is designed to give Toronto-area homeowners complete peace of mind. Save Big on Your Heating Bills! – Upgrade through rental is a great idea because the savings opportunities are immediate. Rather than waiting for your old unit to die and in the meantime suffering the high utility bills due to its declining efficiency, upgrade with us now and start saving today. Free Annual Maintenance – Our high-efficiency models are just the thing to cut your monthly utility bills by a significant amount and because we offer complementary annual maintenance to all our renters, you never have to worry about the efficiency of your furnace or AC unit slipping. We will start you out with a super-efficient model and keep it working at an optimal level. Save Even More with Rebates – Upgrading is also an unbeatable option because Ontario utility companies and local government offer rebate incentives to those who install approved makes and models (of which we have plenty) in their Toronto homes. These rebates coupled with annual energy savings can pay for your rental within a few years. There has never been a better day to rent and upgrade than today!